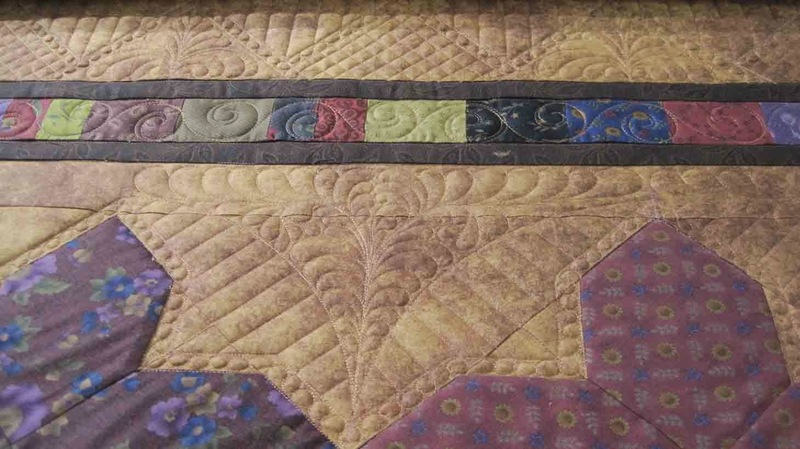 No Rules Quilting: Dorothy's Amazing Quilt - Finished! 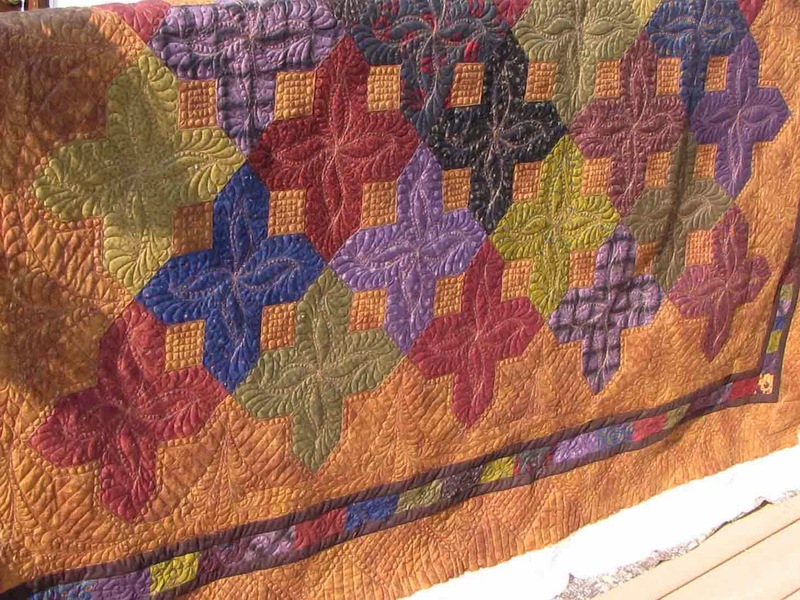 Dorothy's Amazing Quilt - Finished! 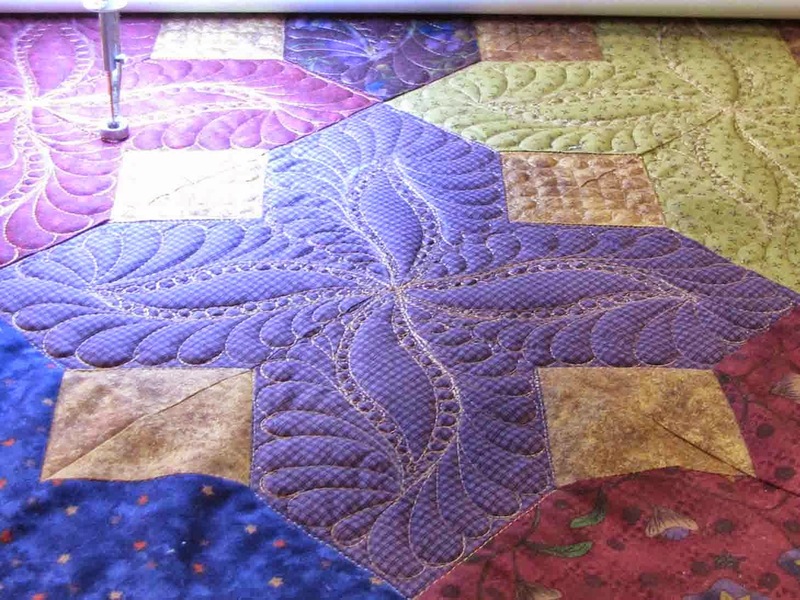 I finished Dorothy's quilt last week and delivered it. I am very pleased with the way it turned out and Dorothy really likes it, too! The first few pix are the finished project. 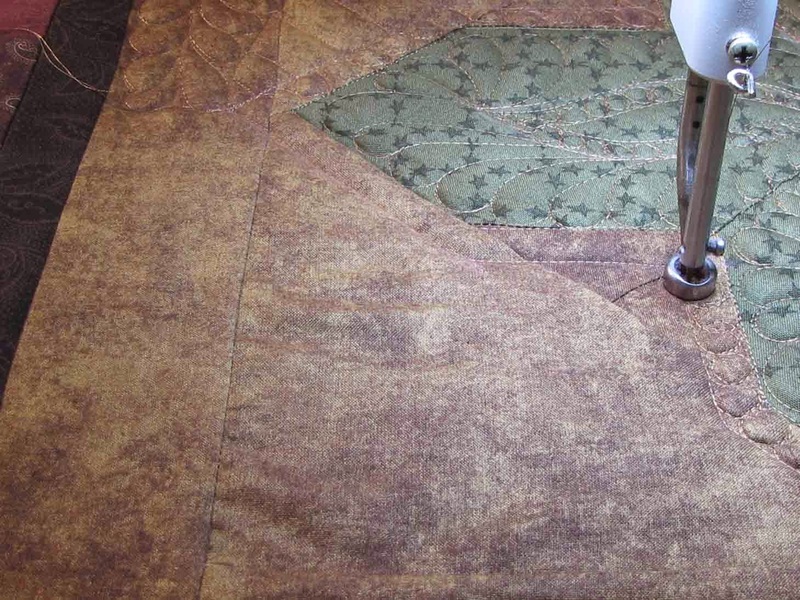 Below them I've tried to give a step by step of how I did some of the quilting in case someone out there wants to do a similar thing. 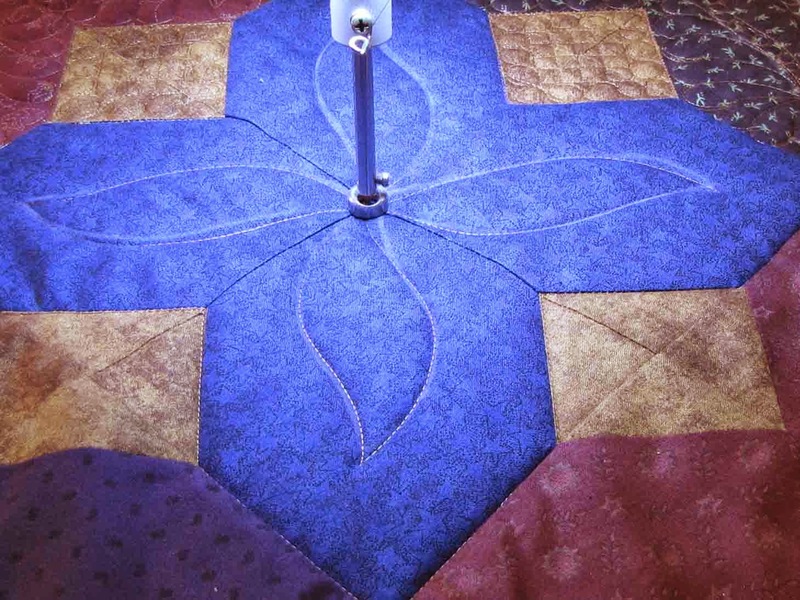 Following is how I did the cross designs. Step 1: make a paper template of the "skeleton" shape - what is this shape? I was going to say "serpentine" but then I looked I up - not quite right. Anyway - the shape of the paper in the pix. Step 2: Trace around the template, as shown. 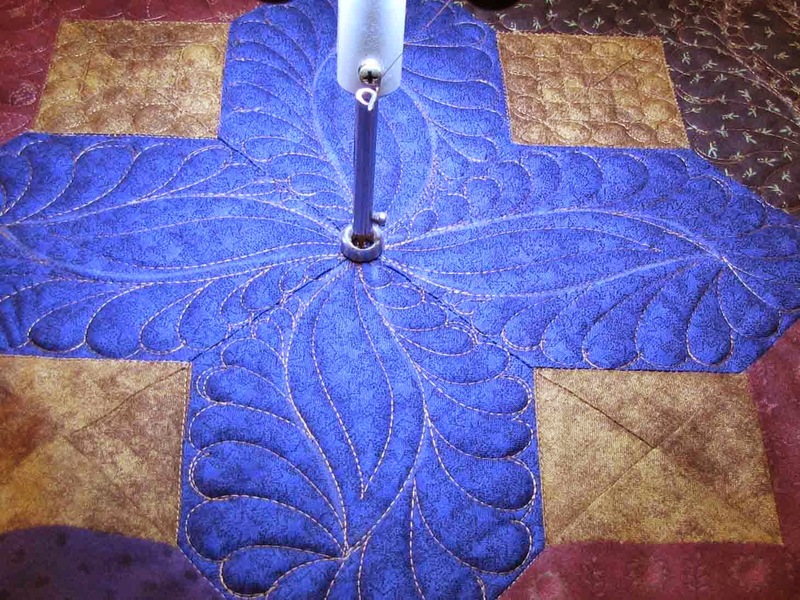 Step 3: stitch around the shape in each arm of the cross. Remember - the shape is a guide so it does not have to be perfect. 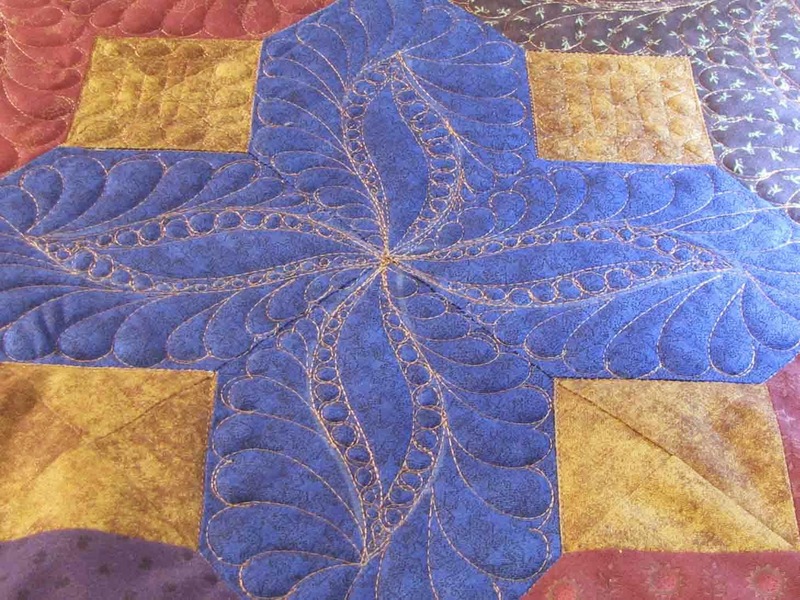 This is the difference between freehand and computerized quilting. Step 4: the skeleton shape becomes the spine for feathers - so add the feathers. 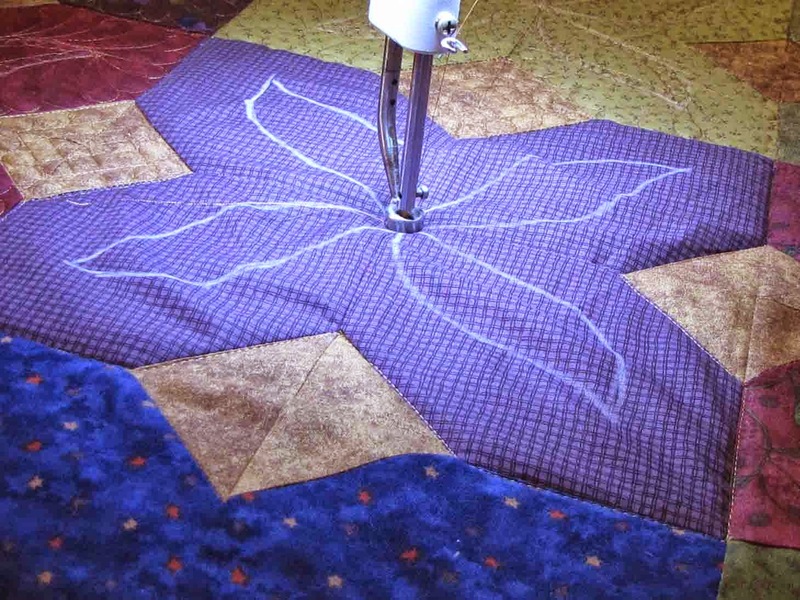 Step 5: stitch an echo inside the skeleton shape. Step 6: add pebbles between the echo and skeleton. Done! Repeat Steps 1 - 6 across the row. 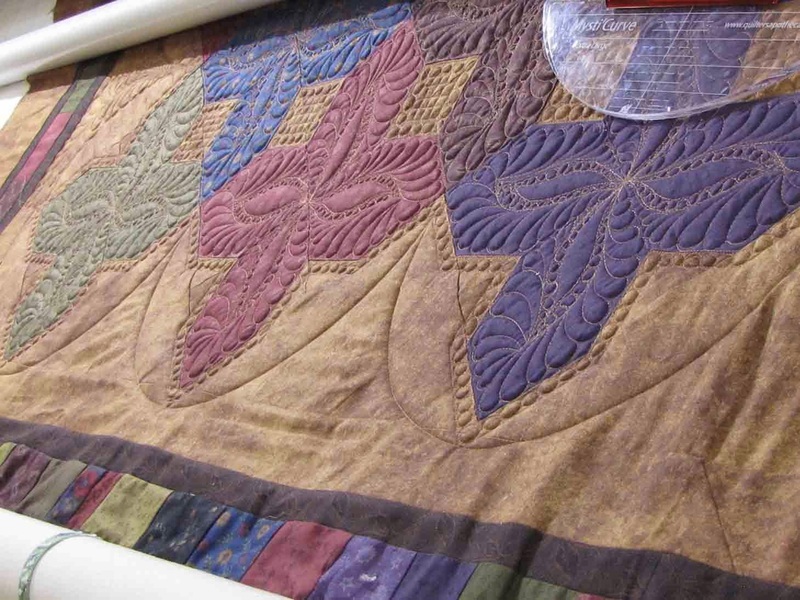 Comment: Dorothy's quilt was a very ambitious project for her level of skill. 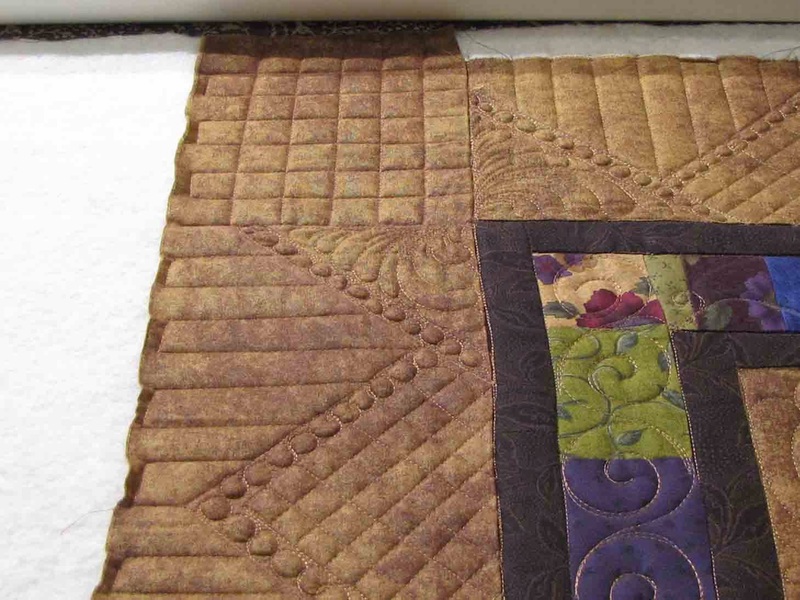 This combined with "soft" fabric resulted in a number of blocks that were pretty "full" (as per above pix). 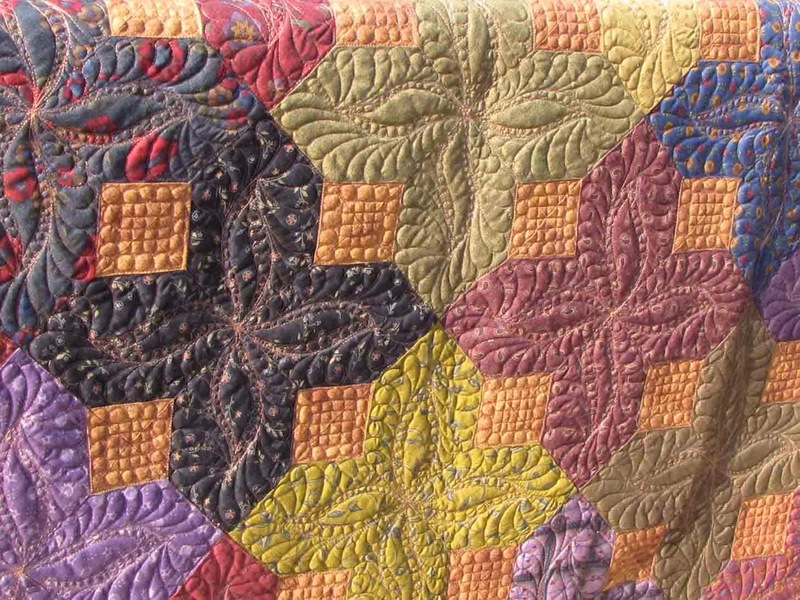 This quilting design did a very good job of taking up the slack. The "fullest" blocks just ended up looking as if they were trapunto (below pix). Next up - the outside between the "crosses" and the border. 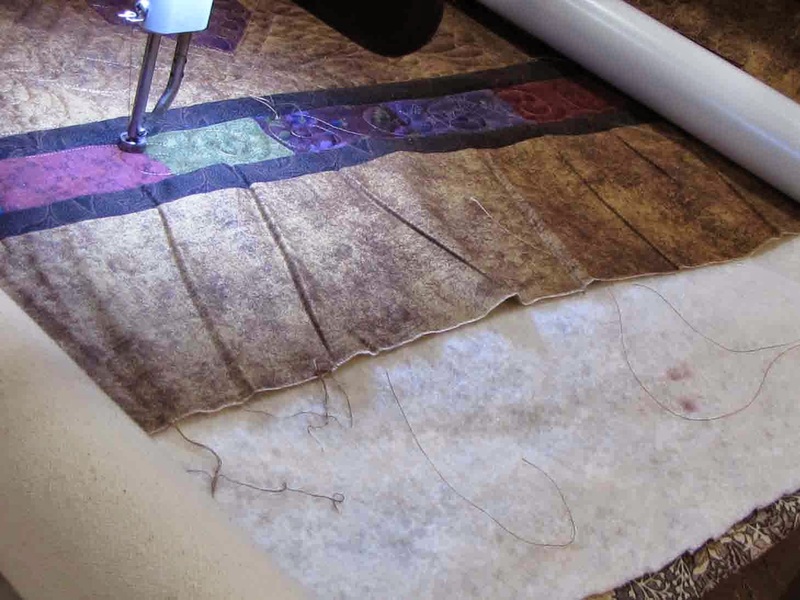 Step 1: stitch 1/2 inch around the perimeter. 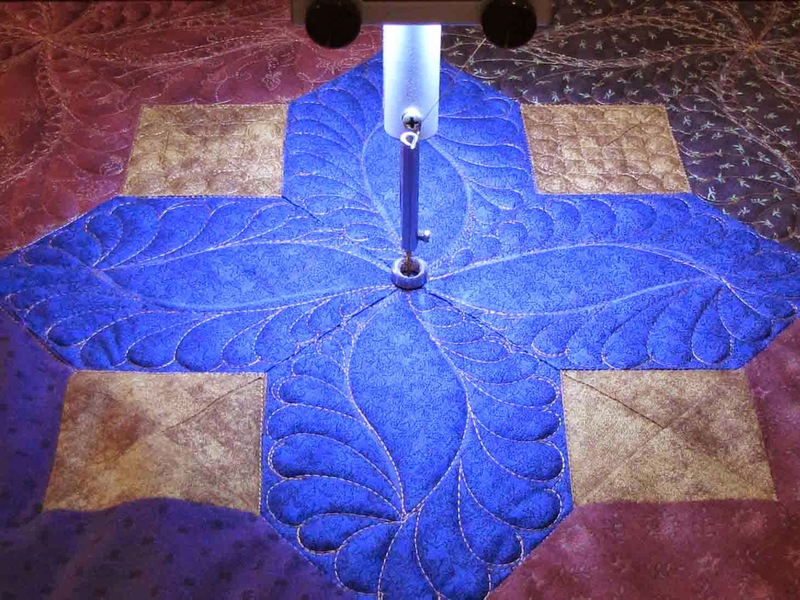 Step 2: pebble between the stitching line and the block. 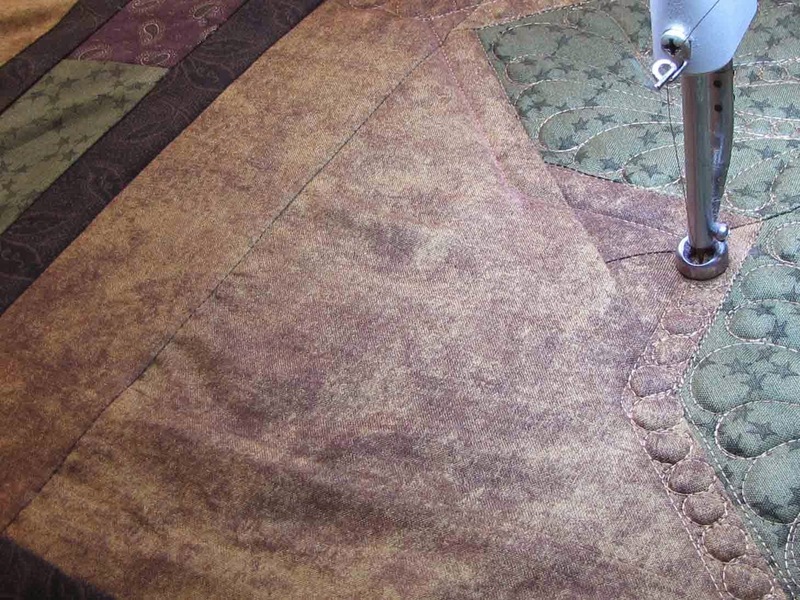 Step 3: stitch the semi-circles from point to point as shown in the below 2 pix. 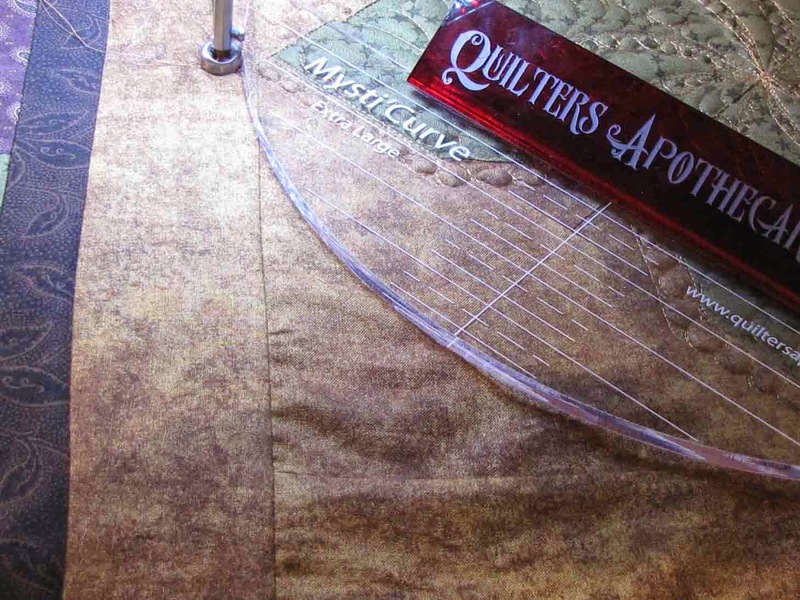 I used the Mysti-Curve ruler shown in below pix (from Jamie Wallen's website). Step 4: mark the hatch lines - I used a chalk marker - lines 3/4 inch apart. 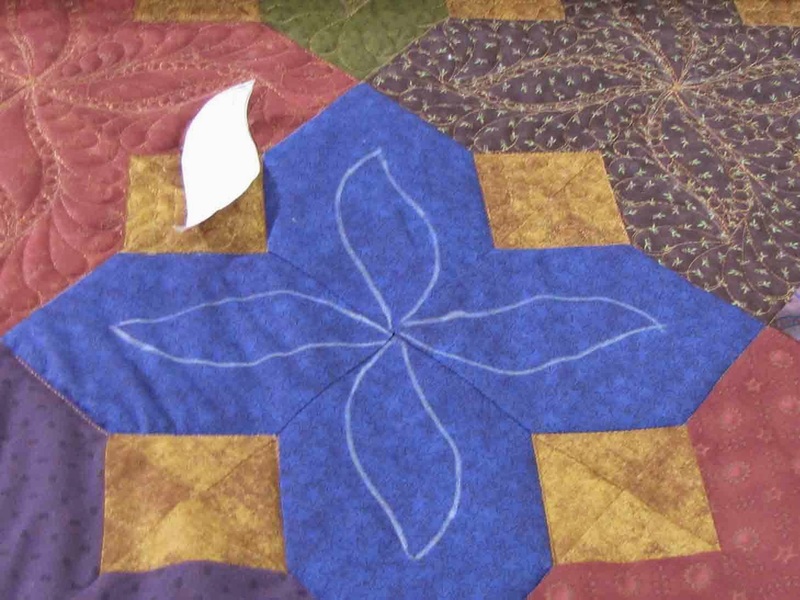 Note these are not random - start in the centre of the indent and work out to the edge. If not divisions of the width (in my case 3/4"), fudge at the edges. Step 5: Stitch the hatch lines as per below. 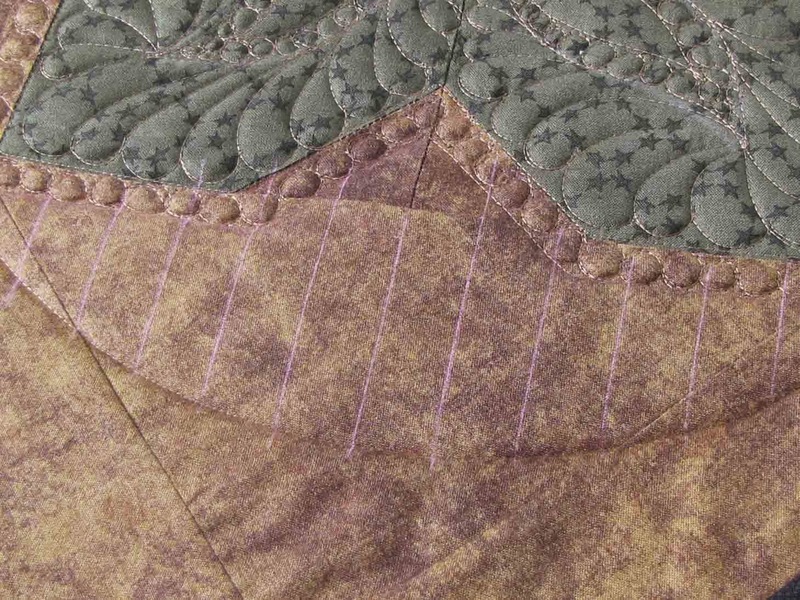 Step 6: stitch the feathers between the border and semi-circles. Of course I didn't take pix of this but refer to the pix at top where it shows the feathers. 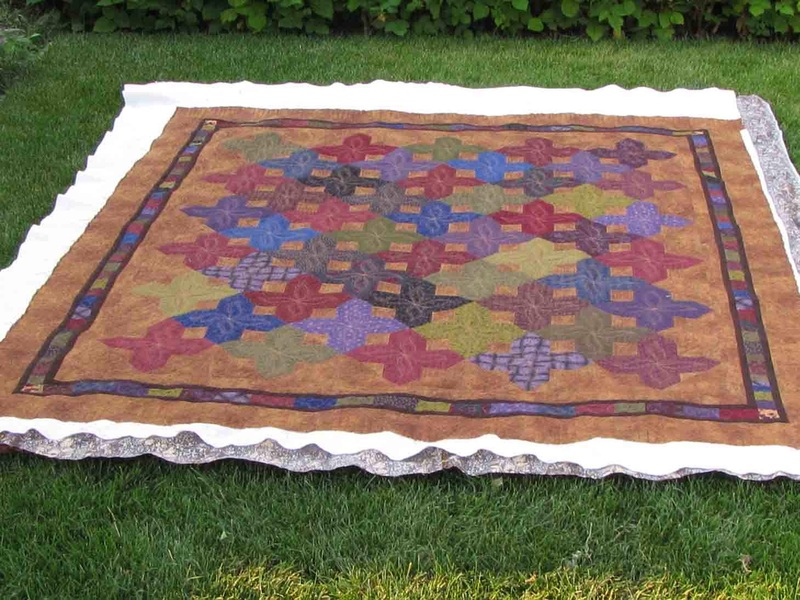 This quilt was not square. 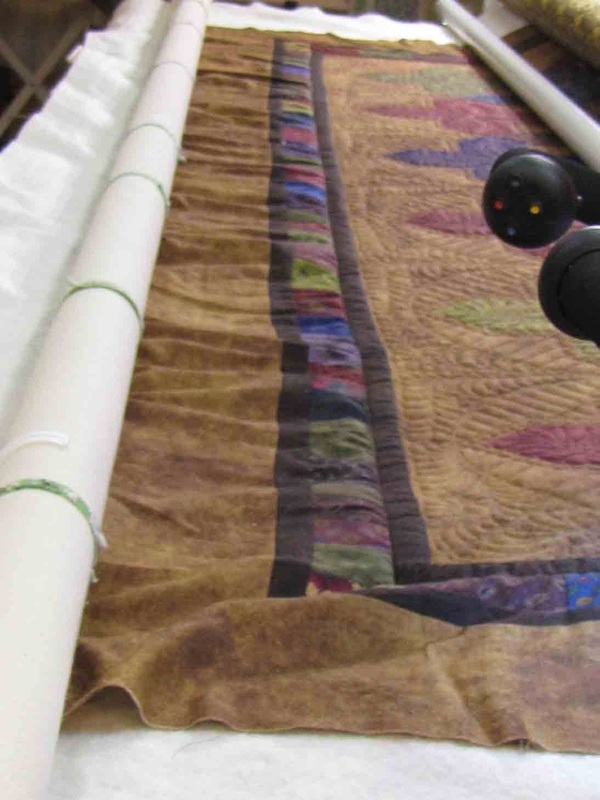 One side was between 4 & 5 inches longer than the other - too much to try to quilt out or square up on the frame. 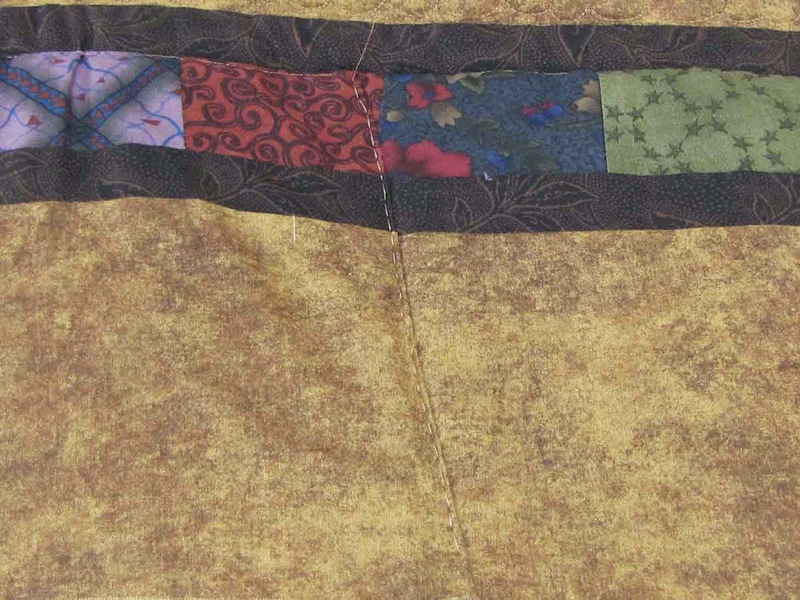 As you can see from the pix below, there was simply too much excess fabric to be able to "quilt it out". I decided to take the somewhat drastic step of making a few pleats in the border - in the end I believe there were about nine of these. I "let the fabric tell me" where to put the pleats. I basted them in as shown below. 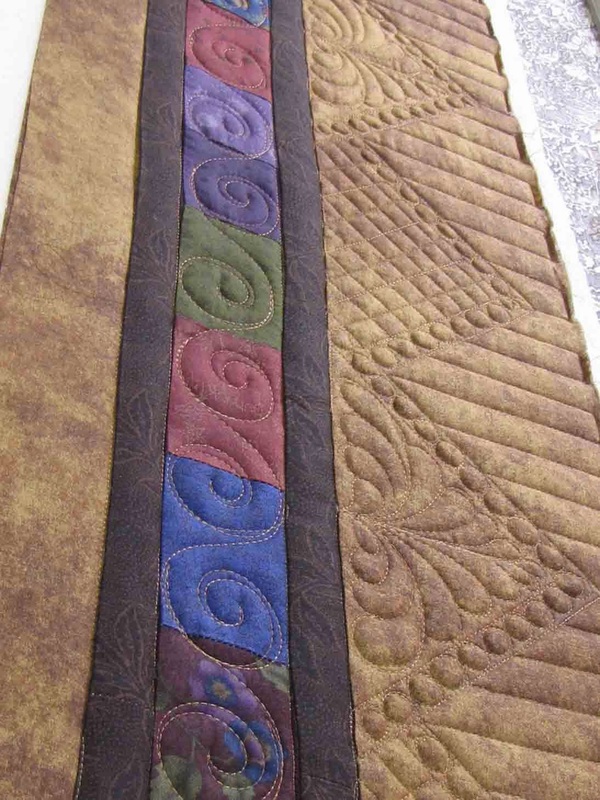 Once the pleats were basted in, I quilted as if the quilt was perfect. 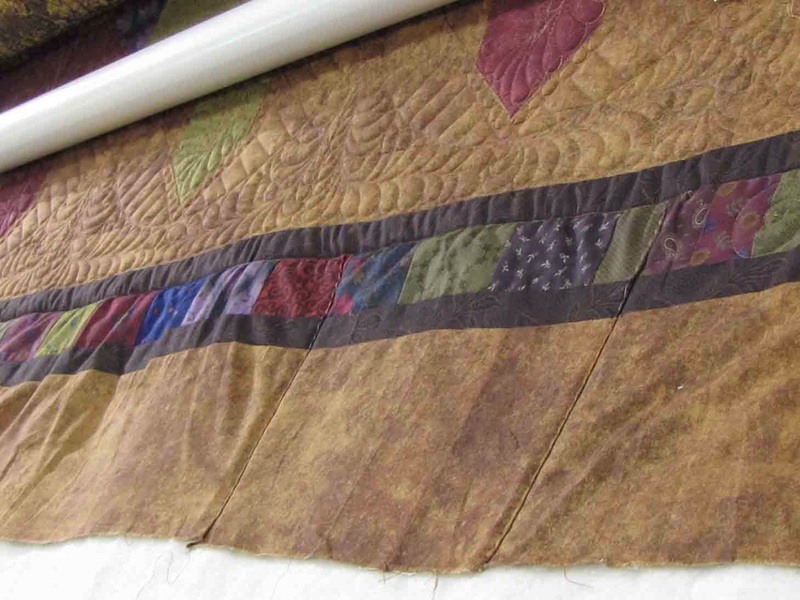 Once it was off the frame I removed the basting and hand stitched them down so they will not be noticed. When I went to find them to show Dorothy, I could hardly see them myself. It took out most of the extra - I think there might still be an inch or so difference in the sides, but on a bed, it won't be noticeable. 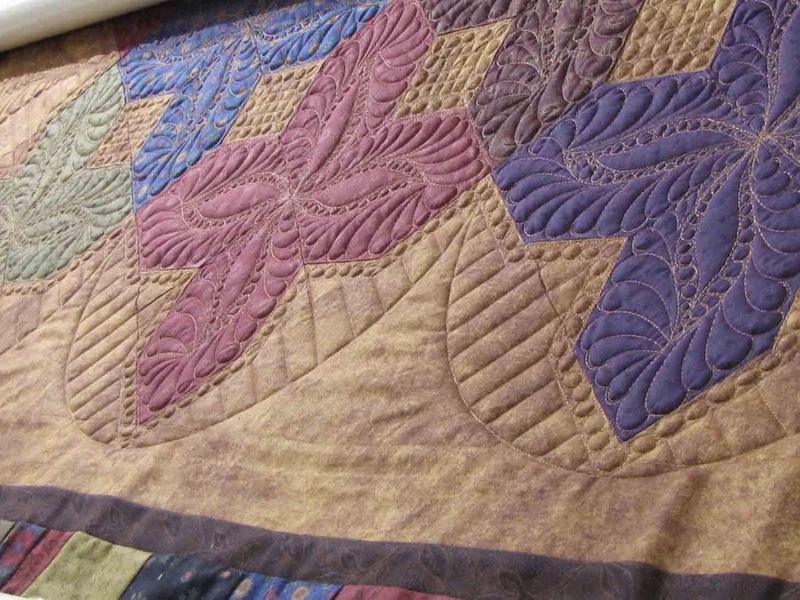 And as you can see from the top pix, the quilt lies nice and flat. All in all a happy ending!